29, of Lenox Township, died as a result of an automobile accident, Thursday, February 7, 2019. Adam was a 2007 Richmond High School graduate. 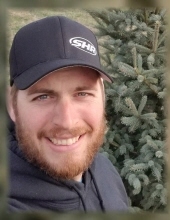 Following graduation from High School, he attended Macomb County Community College and graduated on the Deans’ List from the Comprehensive Automotive Training Program, which led to working as a heavy equipment mechanic for over 12 years for DNR Customs, Esper Farms, MTA Transport, and ML Chartier. He was most recently employed as a Lineman Apprentice with the IBEW Local #17. Adam was an active member of the Columbus Bible Church. Adam played Little League Baseball in Richmond for eight years with his dad David being the head coach. In the year 2000 the team achieved first place in the major-minor league and in the year 2002 they were the major district champs. He was a cub scout as a kid and he enjoyed bowling. Adam loved being outdoors and liked kayaking, snowboarding, snowmobiling, and riding dirt bikes. He was always willing to help anyone, anytime, anywhere. Adam loved hunting with his dad, tractor and truck pulling and was a member of the Eastern Michigan Tractor and Truck Pulling Association and the Thumb Tractor Pulling Association. He loved animals and most importantly enjoyed spending time with his family and friends. Surviving in addition to his mother Carol-Ann are grandparents, Eddie and Janet Higgins of Columbus Twp. and Linda Martindale of Florida; aunts and uncles, Judy (Mark) Covert of Clyde Township, Christine Martindale of Wales Township, John (Kim Schmidt) Martindale II of Wales Township; cousins, Matthew (Jessica) Covert, Andrew, Kenny, and Jonathon Panczyk, and Lauren and Caleb Schmidt; his longtime girlfriend Kelly Fanale; as well as many dear aunts, uncles, cousins and friends. He was preceded in death by his father David July 9, 2018, grandfather, John Martindale and cousin, Jaclynn Covert (Baby Nicholas a.k.a. Licorice) Hildebrandt. To send flowers or a remembrance gift to the family of Adam Lee Higgins, please visit our Tribute Store. "Email Address" would like to share the life celebration of Adam Lee Higgins. Click on the "link" to go to share a favorite memory or leave a condolence message for the family.